Every year we set aside a handful of acres for Oat and Cereal Rye production. 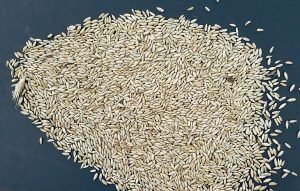 These small grains are grown for a variety of reasons, but mainly for livestock feed, cover crop seed, and straw production. Small grain harvest takes place from late July into early August. We save back enough seed every year for our own cover crop needs and any excess is sold. Contact us for availability and pricing!